The Project Lead is the central figure for the porting of the licenses into national law. He/she would be an expert in copyright law, more often than not a lawyer, and more often than not associated with the Institution or Law Firm. In some countries iCommons will identify the Project Lead first and ask him/her for help in finding a renowned copyright Institution or renowned Law Firm. In other countries, we will be in contact with the Institution/Firm first and will try to find a Project Lead from within. To preserve the global spirit of Creative Commons, we strive for utmost similarity between the licenses worldwide. It is very important to us that the porting be very close to the original and go into the specifics of national law only when absolutely necessary. Once the first draft of the licenses is produced, it should be re-translated into English. This step is for us from Creative Commons, so we can learn what differences the legal systems of the respective countries have brought into our licenses. We should look for the first drafting of the ported licenses to take no longer than 1 month. Creative Commons will make the first draft of the licenses accessible on the iCommons website for public discussion via a mailing list and archive, provided by iCommons. Both the Project Lead and iCommons will make concentrated efforts to drive expert traffic toward the project e-mail list. This discussion again should take no longer than 1 month. In a new draft, the Project Lead could incorporate any ideas he/she liked from the public discussion. This re-draft, however, is optional: the Project Lead may decide to stay with the original draft, if none of the ideas brought forward seem usable. And again, Project Lead will provide an English translation of this second draft. In some cases, this “review” will be done on a public email list; in others, offline. Either way, the Project Lead and Creative Commons will work on producing a result everyone will be happy with. Ease-of-use by non-lawyers has been Creative Common’s priority since its birth. Therefore, it is important to us that, in addition to the ported licenses, the Project Lead produce a translation or adaptation of our human-readable layer in the national language, the Commons Deed, which gives a brief graphic explanation of what the licenses stand for. Up to this point, creativecommons.org will have listed links pointing to the Lead’s website, and to important places of national discussion and/or press coverage (as provided by the Project Lead). At this moment, however, we place the full final licenses, plus the Commons Deed, on our website, in the national language. Whether the launch be in form of a party, a convention, a television program, a press conference or all of the above will be up to the Project Lead. What is important to us is that the event attract the kind of publicity we need to make sure that people will know where to turn to for “creative work available for others to create upon and share”. To check if somebody is already working on it. If no to initiate the work. I am sending a mail to her today. Will update you guys what happened. I was going through the list of countries which have their own version of Creative Commons. I was surprised not see the name of India. Now I am interested to have our own version of Creative Commons. Before I start putting effort towards, I want to know if somebody is working towards Indian Creative Commons. Please let me know if somebody is working on it. If not I will try to spread a word amongst people so that we can work towards it. Eagerly waiting for your replies. And all the best for the iCommons effort. 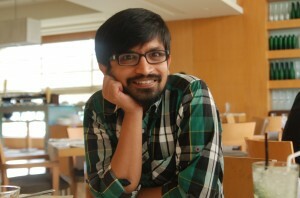 Please meet Shishir – our CC project lead in India! Step 3: Mail Shishir Kumar Jha asking for details. Can I know in which Status the CC license is in. If you can give me some details it will be useful. of the license and a dicussion on the usefulness of CC in India. Next story Hammerstein’s Letter to Indian MPs about patent laws.